Mr. Lyfoung was a Hmong political leader. He was born in 1917 in Nong Het, Laos. He graduated from a French high school in Vinh, North Vietnam and he attended an administration training in Vientiane, the capital of Laos. In 1940, Mr. Lyfoung was elected as Chief of Nong Het District in Xieng Khouang province, Laos. In 1945, he organized the anti- Japanese resistance in the Xieng Khouang plateau. As a result, in 1964 he was appointed Deputy Governor of Xieng Khouang province and became Chaomoung (Mayor) of the Hmong population. 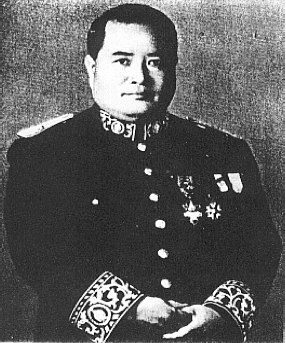 Lyfoung took sides with the Royal Lao Government to fight the Communists in Laos and led a Hmong anti-Communist movement against the Pathet Lao. In 1958, Mr Lyfoung won the legislative elections in Xieng Khouang province and was elected as Vice-President of the National Assembly. In 1960, he served as Minister of Justice and Social Welfare. In 1961, he became Minister of Health. In 1964, he joined the King’s Council. In 1972, he was appointed as the Inspector General of the Southern Province in the Ministry of the Interior. In 1974, he served as Deputy Minister of Telecommunication in the Provisional Government of the National Union. Mr. Lyfoung was not only a Laotian national political leader. His contribution to building modern Laos is universally known. His efforts focused on the integration of all ethnic groups into the Laotian nation. In 1939, he built the first village school in Nong Het for the Hmong and minority ethnic groups and developed the school system in the Xieng Khouang plateau. process and worked toward the Laotian National Reconciliation in 1974. After the takeover of Laos by the Communist Pathet Lao in 1975, he was arrested and sent to a labor camp along the Vietnamese border where he died in 1979. Mr. Lyfoung was a man who offered strong political leadership and a great sense of responsibility. He was a role-model for today’s Hmong leaders and for generations to come.